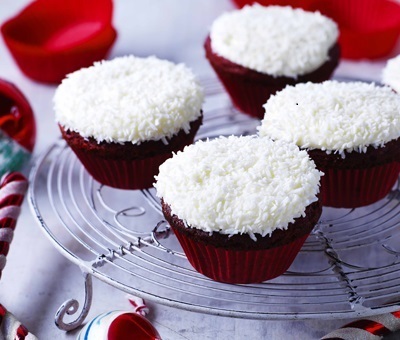 For all the coconut lovers out there, try our delicious snowball cupcakes, which will ensure for a delicious treat at the end of a dinner. Preheat the oven to 180°C, (160°C for fan ovens), Gas Mark 4. Place the cupcake ingredients in a bowl and beat with an electric hand mixer for 2-3 minutes until creamy and vibrant red. Add more colouring if the mixture looks pale, the colour will fade when baking. Spoon into the cupcake cases and bake for approximately 15-18 minutes until springy to the touch. Transfer to a cooling rack to cool. Beat the icing sugar and buttery baking spread in a bowl until light and fluffy, then add the Carnation Condensed Milk and cream cheese and beat until combined. Spoon or pipe tablespoons of the frosting onto the middle of the cake. Then dip in the coconut (the icing will spread). Dust with a little sparkly snow, if using.